Biltmore Village Area! Toujours "comme neuf"
Notre maison est située à quelques minutes de la succession Biltmore. Marchez jusqu'au village de Biltmore et trouvez des magasins uniques, des boutiques et de nombreux restaurants dans les environs, notamment Corner Kitchen, WellBred, Red Stagg Grill, Barbecue Original de Moe, Rezaz, Fig, Cantina, Wayside Grille, Steakhouse Ruth Chris, TGIFriday, Texas Roadhouse, Standard Pizza Company, Bagels Brueggers et Starbucks. Un certain nombre de brasseries / salles de dégustation sont également accessibles à pied: French Broad, Catawba, Hillman, Highwire et Eda Rhyne distillary. Nous sommes dans un quartier au bord de Biltmore Village et notre emplacement offre un accès facile à tout ce que Asheville a à offrir. Vous ne voudrez pas manquer une promenade sur la Blue Ridge Parkway et tout est beau et peut-être une excursion d'une journée à Brevard pour voir toutes les cascades étonnantes. Chimney Rock et Grandfather Mountain sont de bonnes excursions aussi. Trop de choses à apprécier ici dans l'ouest de la Caroline du Nord pour les énumérer tous. Venez voir par vous-même. La maison est entièrement meublée, avec des ustensiles de cuisine et des draps. Il y a des télévisions dans deux chambres et le salon principal. La cuisine, le salon, la salle à manger et la chambre des maîtres sont tous situés au rez-de-chaussée. Il y a aussi une demi-salle de bain et une buanderie dans la cuisine. La suite principale avec un lit queen et une salle de bain privée est au niveau principal, les 2 autres chambres, avec des lits queen, se trouvent au dernier étage et partagent une salle de bain complète. Beau porche pour profiter des oiseaux et de l'air de montagne. Le sous-sol est un appartement séparé où vit notre plus jeune fille. Il est complètement fermé de la partie supérieure de la maison. DEMI bain est OFF salon d'étage principal. We had a long term stay (6+ weeks) and really enjoyed this home. It is extremely well stocked with everything you need. The owners have been doing this a long time and it shows. The location is great within walking distance of Biltmore Village with a beautiful coffee/pastry shop with wonderful breakfast sandwiches, a really good Mexican restaurant, and a great bbq joint. Also many interesting shops in the Village and of course The Biltmore Estate is nearby. We were very comfortable here for a long stay. The only thing I might wish for would be higher speed internet service - it is OK but not as good as our home service. However, sitting outside on the deck in the mornings with coffee and a little coolness in the air was wonderful for us as we were escaping the Florida blast furnace summer! We have been to Asheville several times to visit friends, but this was the first time we rented. We were here for 6 weeks and the house was just like home. Jim and Terri have done a wonderful job giving it a homey feel but not dated and kitchy. Many folks who own rentals put in cheap furniture, linens, and kitchen equipment, but not here. The location is perfect...neighborhood feel but walking distance to shops, restaurants, etc. It's a 45 second walk down the street to an excellent bagel shop. Then there's a 5 min. walk to great restaurants and a fabulous bakery that also makes breakfast and lunch. Their signature item is huge éclair that we served to six people. There are also several breweries a 5 minute walk away. Uber services are readily available if you prefer to forego looking for parking downtown. Anyone would love staying here, especially getting a personal greeting everyday from Charlie, the friendly black cat. Give this place a try. You'll be glad you did. Very convenient location close to the Biltmore Village and shopping. Great park to walk along the river about 5 minutes away. The homes in excellent condition and is well equipped especially if you like to coThe The owners are easy to get along with and respond quickly. We stayed a month and enjoyed it. We spent three months at this great property. Teri and Jim provided everything we needed. The house is spacious, has a great kitchen with all the appliances (a blender for post-workout smoothies! ), great seating indoors and out, a really nice master suite on the first floor with two nice bedrooms and a full bath upstairs for our guests. Loved that the laundry room had a drying rack in addition to the washer and dryer. Touches such as umbrellas by the front door and blankets in the living room for couch snuggling are just a couple of examples of the care and thought that Teri & Jim put into this home. On top of the great space, Teri & Jim are fabulous hosts. They are warm and friendly, helpful with suggestions for dining and activities. Since we spent Christmas here, Teri gave us decorations, including a small tree and a wreath for our front door - definitely an unexpected bonus. Given how much thought and attention Jim & Teri put into everything, I would hihgly recommend this or any other property they have. This is an outstanding property rental. It is new, clean, spacious, on a beautiful lot with a private drive, and right in Biltmore Village. 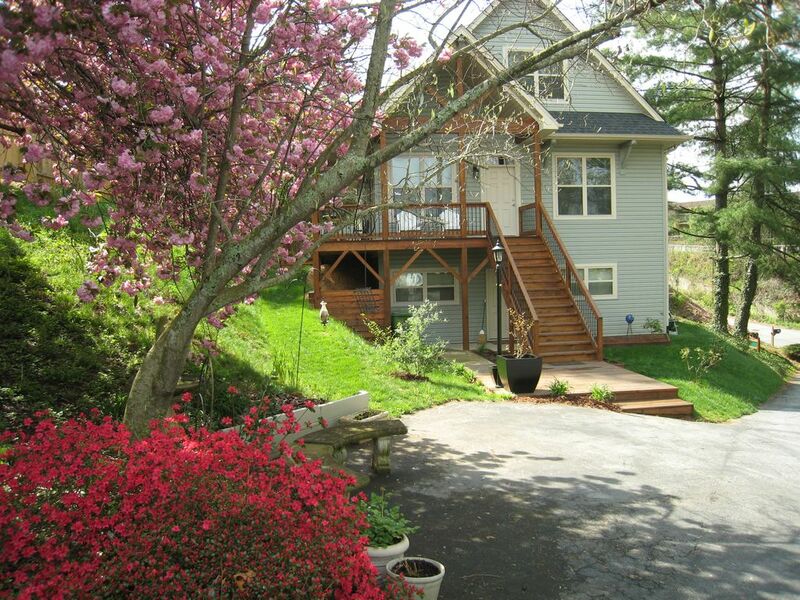 It is the best location; central to everything the Asheville area has to offer. All summer long we would ride our bikes down the hill, be in the front gate of the Biltmore Estate in 3 minutes, and ride the numerous trails throughout estate.... such beautiful country with so much to do. It is only a 5 minute walk to all the shops and restaurants that Biltmore village has to offer. Jim and Teri are a fabulous couple, attentive to all our needs. I can't say enough good things about our experience at 115 Reed St.
Amusement intérieur Depot- amusant pour les enfants, moins de 5 minutes en voiture. Harrahs Cherokee Casino est d'environ 45 minutes en voiture.